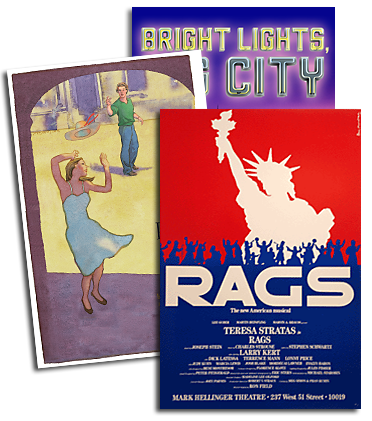 Musical theatre fans have five new compact discs to add to their Rodgers & Hammerstein collections this fall. Following the 21 R&H albums released earlier this year by five different labels to commemorate Rodgers & Hammerstein's fiftieth anniversary, repackaged versions of three classic cast albums and two unique compilations keep the party going. Sony Broadway re-releases the original cast recordings of FLOWER DRUM SONG and THE SOUND OF MUSIC, and adds the soundtrack of the 1965 CBS television broadcast of CINDERELLA. Columbia House continues their "Great American Composers" series with Rodgers & Hammerstein, two volumes dedicated to the work of R&H, both together and with other collaborators. And TVT Records gives us An Evening With Rodgers & Hammerstein, the third installment in their innovative series, "The Best of Broadway," with performance material drawn exclusively from The Ed Sullivan Show. THE SOUND OF MUSIC and FLOWER DRUM SONG were among the earliest musical compact disc releases, and are now reissued with the full Sony Broadway treatment, featuring completely remastered sound, new liner notes and packaging. As Didier Deutsch points out in his notes for FLOWER DRUM SONG, Rodgers and Hammerstein wrote the show in 1958 "with the idea of doing something decidedly different." Although the score included strong traditional Broadway fare such as "Grant Avenue" and "I Enjoy Being A Girl," the instrumentation and lyric structures throughout the show introduced Far Eastern elements - taking certain influences even farther than they had in THE KING AND I. The Grammy winning original cast album of THE SOUND OF MUSIC boasts captivating performances from Tony-winners Mary Martin and Patricia Neway, plus Theodore Bikel's defining rendition of "Edelweiss," the last song written by Rodgers & Hammerstein. Rodgers & Hammerstein first brought their version of CINDERELLA to television in March, 1957. Its one-night-only live broadcast on CBS played to an astounding audience of 107 million. In 1965, CBS presented a revised version - this time on videotape for repeated airings - starring Celeste Holm, Ginger Rogers, and a relatively unknown 18 year old Lesley Ann Warren in the title role. Now, Sony Broadway has issued this TV cast album on compact disc for the first time, joining the previously issued original recording starring Julie Andrews, and just in time for CINDERELLA's New York stage debut with New York City Opera this fall. As documented on TVT's new The Best of Sullivan: An Evening With Rodgers & Hammerstein, numbers from every one of the eleven R&H stage and screen musicals were highlighted on Ed Sullivan's popular Sunday night show, offering a rare opportunity for a complete anthology album. Indeed, the producers of this collection of unique recordings were so determined to present selections from each R&H show that when the Sullivan estate archives failed to yield any numbers from the July 26, 1953 broadcast spotlighting ME AND JULIET, advertisements were placed in collectors' journals until a mint condition kinescope of the episode was found. As culled from the TV broadcasts, it is fun to hear R&H regulars performing songs other than their signature pieces: Celeste Holm with "A Fellow Needs A Girl" (from ALLEGRO), Miyoshi Umeki's "In My Own Little Corner" (from CINDERELLA) and Marion Marlowe's "The Sound Of Music" make this a collection of rare distinction. The breadth of material contained on the TVT compilation is rivalled only by the new two volume, four disc offering from Columbia House, The Great American Composers: Rodgers & Hammerstein. In addition to well known selections from original cast albums, the collection includes selections from shows written by R&H with other collaborators (such as Hammerstein and Kern's SHOW BOAT and Rodgers and Sondheim's DO I HEAR A WALTZ? ), as well as cuts from rare studio recordings. Rodgers & Hammerstein's far-reaching contributions to the world of popular music are represented here by a stunning cross section of artists, from Mahalia Jackson and The New York Philharmonic, to Doris Day and The Mormon Tabernacle Choir with Sherill Milnes. Accompanied by an impressive 30 page guide from Roy Hemming, this collection is currently only available through mail order. For further information contact Columbia House, 1221 Avenue of the Americas, New York, NY 10020-1090.